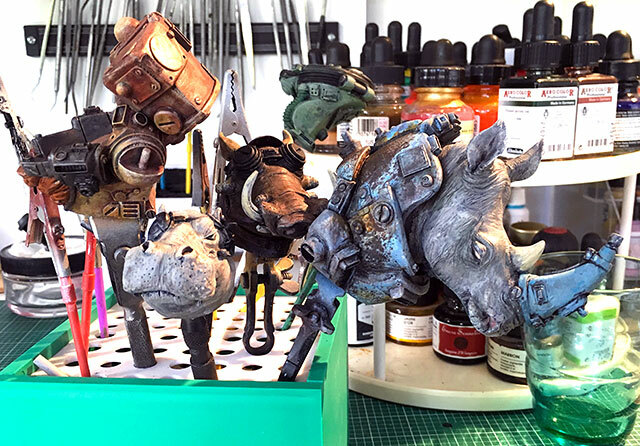 After a longish break from doing any painting due to an ulcerated foot (basically I had to stay off my feet for two months or risk pain and swelling), I’m tackling this great set of animal astronauts sculpted by Raccoon Miniatures. 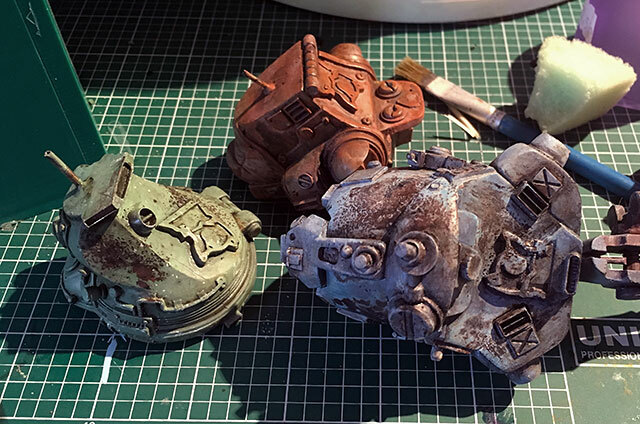 The plan is do the space suits in muted colours with some chipping to reveal rust, seen here as underpainting. I might even try out the hairspray and salt chipping technique. The salt and hairspray worked reasonably well. I put a coat of Johnson’s Klear over the rust layer and then matted it which gave it some protection. 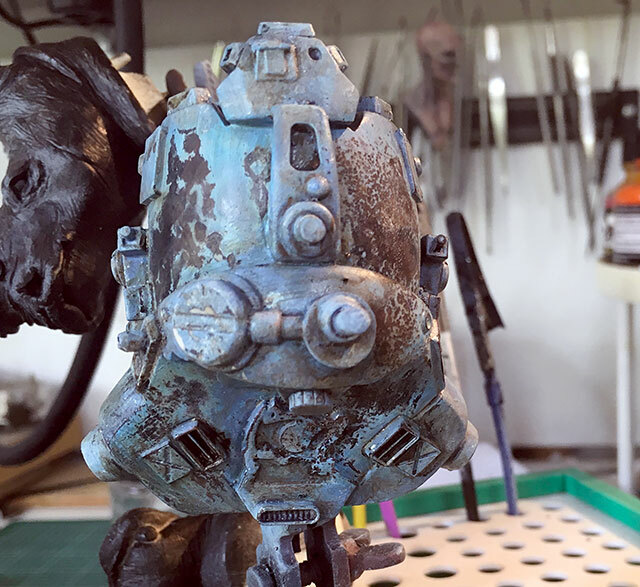 Used an airbrush to put the paint layers on but hairspray from the can. Scrubbing the salt with a wet brush gave the best results. I tried scratching with a toothpick too but it was difficult not to scratch down to the white resin. Thought I might be able to scratch the edges and insets of the vents but it’s probably easier to dry bush the rust in. Pictures shows a couple of washes with Vallejo and ink. I need to decide how much I want to pick out next. Reasonably happy with blue colour, less so with green and orange shades. More modifications. I don’t really have my painting mojo back but I’m tinkering with colours and textures. Looked up reference pictures of the animals but they come in many different shades – dark and light – so there’s no definitive guide. I want to try and differentiate them as much as possible. Used alcohol ink after I took this picture which is great at picking out fine detail but should have sealed first. I’ve started assembling but need to find bases. I don’t have anything in my collection that’s exactly right for them – wooden blocks don’t feel right. Ordered some resin plinths from MDP but no idea if they will be big enough. 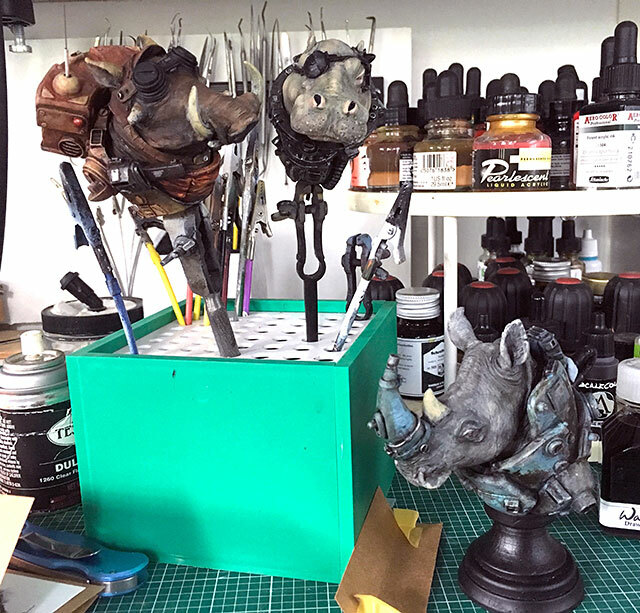 Animals glued into their space suits and rhino glued to plinth. I used dry transfer lettering on the rhino’s space suit which sort of worked but the sheet had no numbers. 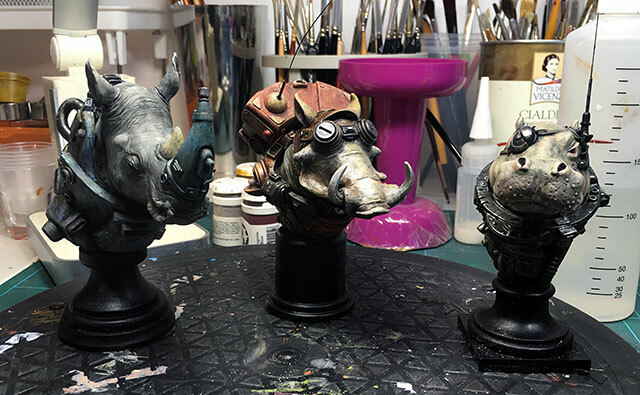 Reasonably happy with Hippo but warthog needs more work on snout. 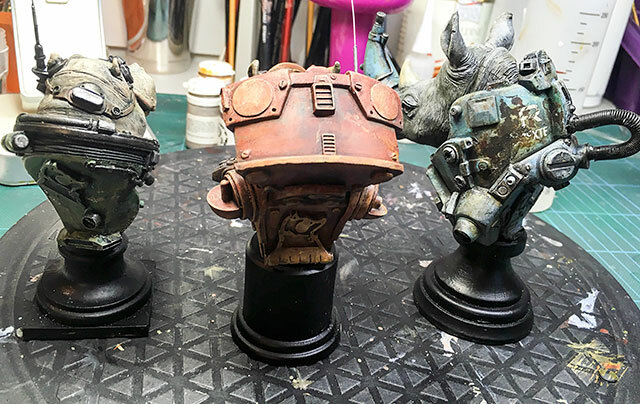 Haven’t painted either’s goggles yet. 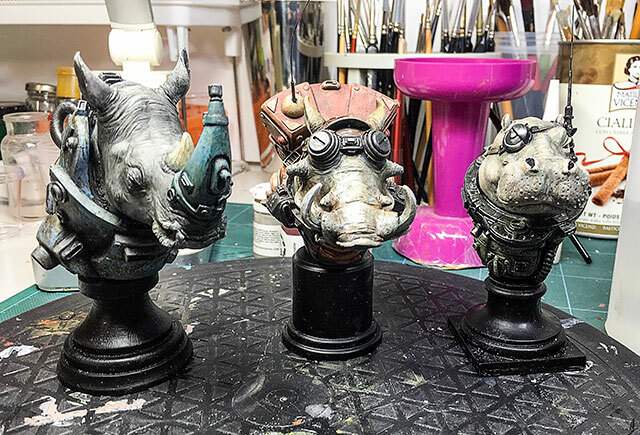 Pretty well finished except I haven’t painted the pupils of the Rhino and Hippo. Reasonably happy with the results. I only used acrylics in the end with buffed metallic paint. As always – could do more. The plinths I ordered from MDP were generally too large but one worked for the Warthog. Need to take pics when I have time. See final build up pictures.